Before beginning a decade, pause for a moment or two----depending upon how much time you have----and contemplate the mystery that you are about to honor in that decade. Always be sure to ask of Almighty God, by this mystery and through the intercession of the Blessed Mother, one of the virtues that shines forth most in this mystery or one of which you stand in particular need. Take great care to avoid the two pitfalls that most people fall into during the Rosary. The first is the danger of not asking for any graces at all, so that if some people were asked their Rosary intention they would not know what to say. So, whenever you say your Rosary, be sure to ask for some special grace. Ask God's help in cultivating one of the great Christian virtues or in overcoming one of your sins. The second big fault a lot of people make when saying the Holy Rosary is to have no intention other than that of getting it over as quickly as possible! This is because so many of us look upon the Rosary as a burden which is always heavier when we have not said it----especially if it is weighing on our conscience because we have promised to say it regularly or have been told to say it as a penance more or less against our will. Hail Mary, full of grace, the Lord is with Thee, blessed art thou among women and blessed is the Fruit of Thy womb, Jesus. At first, you may find it difficult to make these pauses because of your bad habit of saying prayers in a hurry; but a decade that you say recollectedIy in this way will be worth more than thousands of Rosaries said all in a rush----without any pauses or reflection. Blessed Alan de la Roche and other writers (including Saint Robert Bellarmine) tell the story of how a good confessor advised three of his penitents, who happened to be sisters, to say the Rosary every day without fail for a whole year. This was so that they might make beautiful robes of glory for Our Lady out of their Rosaries. This was a secret that the priest had received from Heaven. So the three sisters said the Rosary faithfully for a year and on the Feast of the Purification the Blessed Virgin appeared to them at night when they had retired. Saint Catherine and Saint Agnes were with her and she was wearing beautiful robes that shone and all over them "Hail Mary, full of grace" was blazoned in letters of gold. The Blessed Mother came to the eldest sister and said "I salute you, my daughter, because you have saluted me so often and beautifully. I want to thank you for the beautiful robes that you have made me." 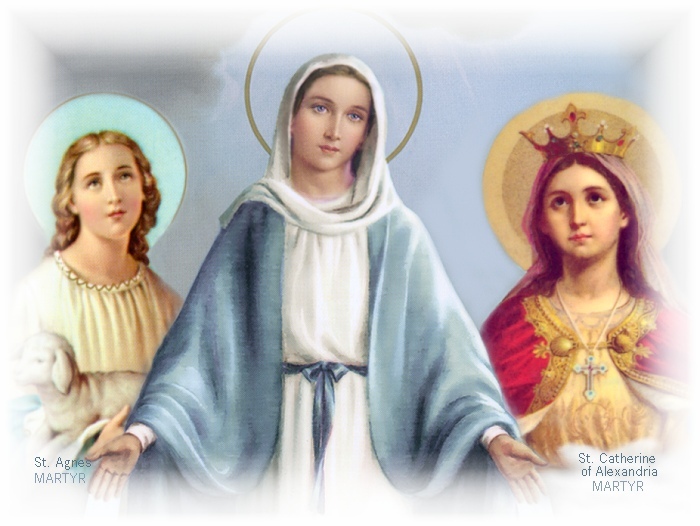 The two virgin Saints who were with Our Lady thanked her too and then all three of them vanished. An hour later Our Lady and the same two Saints appeared, to them again, but this time she was wearing green which had no gold lettering and did not gleam. She went up to the second sister and thanked her for the robes she had made Her by saying her Rosary. Since this sister had seen Our Lady appear to the eldest much more magnificently dressed she asked Her the reason for the change. The Blessed Mother answered: "Your sister made Me more beautiful clothes because she has been saying her Rosary better than you." About an hour after this she appeared to the youngest of the sisters wearing tattered and dirty rags. "My daughter" she said "I want to thank you for these clothes that you have made Me. The young girl was covered with shame and she called out: "Oh, my Queen, how could I have dressed you so badly! I beg you to forgive me. Please grant me a little more time to make you beautiful robes by saying my Rosary better ." Our Lady and the two Saints vanished, leaving the girl heartbroken. She told her confessor everything that had happened and he urged her to say her Rosary for another year and to say it more devoutly than ever. "Our hearts are all ready, dearest Queen; our hearts are all ready." Then the vision faded. That same night they became ill and so sent for their confessor who brought them the Last Sacraments and they thanked him for the holy practice that he had taught them. After Compline Our Lady appeared with a multitude of virgins and had the three sisters clothed in white gowns. While Angels were singing "Come, spouses of Jesus Christ, receive the crowns which have been prepared for you for all eternity," they departed from this life. 4. And finally, how generous she is in rewarding us in life, death and eternity, for the little services that we render Her faithfully.